If sustainable couture is your version of “happily ever after,” consider Ryan Novelline the Prince Charming of green designers. His show-stopping Golden Book Gown is made almost entirely from discarded Golden Books. And while a picture is worth a thousand words, the pages of a picture book are apparently worth 22,000 square inches of skirt. Fashioned into a silhouette reminiscent of what Cinderella wore to that infamous ball, Novelline’s dress features gold stitching and a bodice made from those signature—and shiny!—book spines. Who needs a Fairy Godmother? If sustainable couture is your version of "happily ever after," consider Ryan Novelline the Prince Charming of green designers. 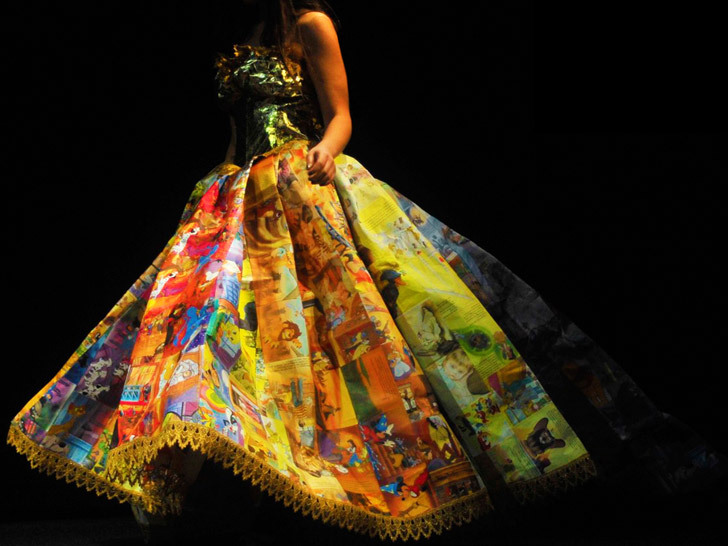 His show-stopping Golden Book Gown is made almost entirely from discarded Golden Books. And while a picture is worth a thousand words, the pages of a picture book are apparently worth 22,000 square inches of skirt. Fashioned into a silhouette reminiscent of what Cinderella wore to that infamous ball, Novelline's dress features gold stitching and a bodice made from those signature�and shiny!�book spines. Who needs a Fairy Godmother?